You may have noticed from my last post (An Indescribable Folly) that I was really rather incensed to learn of the recommencement of building work for the B50 Neu road which will cut a swathe through a large tract of the world’s finest Riesling terroir. Because my anger, and my feeling of utter impotence, would not subside, I racked my brain to see what, if anything, I could do to help. Politicians weren’t going to be interested in any argument I could make, especially given that the Green party had already endorsed the construction project, and I couldn’t think of any A-list celebrities who would either accept my letter or who would wish to become involved in the campaign. Who else could I ask to lend their support to the Pro-Mosel group with a sufficiently high profile to effect a change of policy at a regional government level? This question sent my mind racing off in several tangential directions. To try to explain my thought process, the person I was looking for needed to be a passionate environmentalist, a keen defender of traditional forms of agriculture and be held in high enough regard that the local policy makers could not help but sit up and take note of what he or she had to say. Oh, and a connection to Germany wouldn’t hurt their credibility either. Suddenly, I had a something of a brainwave. There was one person that I was sure would be keen to pick up the baton and run with it in some way, shape or form. His name ticked all of the relevant boxes but I could see no mention of him in any of the earlier articles I had read. The only major stumbling block I could see was the location of the cause in question on foreign soil. Who is this potential saviour, you ask? 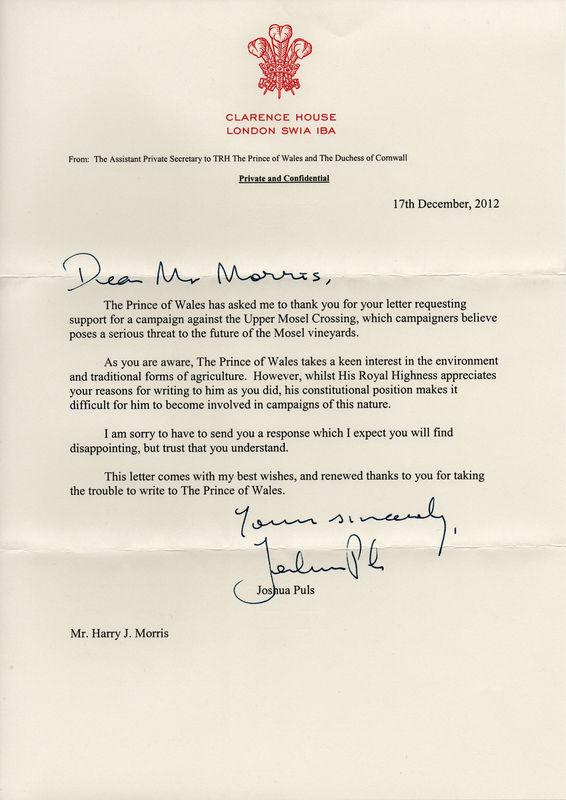 Well, my bright idea (my only idea) was to write to HRH Prince Charles. There was certainly nothing lose, I just needed some help with the practicalities and the protocols of writing to the heir to throne. Fortunately, the prince’s own website supplied contact details; Debrett’s Online provided all of the necessary advice on the associated etiquette. Please forgive my impertinence in writing to you; I do so with the best of intentions and I wonder if I might beg your indulgence and ask if you might read the proceeding pages? With your passion for defending the environment and your championing of traditional forms of agriculture, I write to ask if there is any way you could consider lending your support to a campaign to save some of the most important vineyards in the world. I must point out that I write to you entirely of my own accord, I have no affiliation with any of the individuals, publications or groups mentioned henceforward. I do not know how familiar you are with the wines of Germany’s Mosel river valley, but I cannot overemphasise the unique nature and incredible quality of the Rieslings produced there. Sir, if you have ever been fortunate enough to enjoy wines from vineyards such as Wehlener Sonnenuhr or Ürziger Wurzgarten, I hope that you will not need any further persuasion to read on because these and many other of the region’s finest and most distinctive vineyards are in immediate danger of having their hydrology and geology irreversibly damaged by a long disputed and easily relocated civil engineering project. Whilst I fully appreciate that this is not a British issue specifically, I sincerely hope this will not dissuade you from reading on. Protecting against cultural and ecological barbarism on a scale such as this is the responsibility of everyone, but unfortunately matters have reached a point where I believe that only someone of your importance and prominence might now be able to exert sufficient influence over the relevant policy makers to encourage them to re-examine the impact of this particularly ill-conceived project. As several more prestigious and better-qualified writers have done, I have outlined the situation in my recent blog post, a copy of which is printed overleaf (https://www.harryjmorris.com/harry-j-morris-wine-blog/2012/11/8/an-indescribable-folly). I have also included printed copies of the articles linked to in my blog post, arranged chronologically. Whilst it was a genuine pleasure to receive such a polite and well written letter, and whilst I realistically couldn’t have expected a different response, I had hoped for something that suggested His Royal Highness had even been made aware of the issue and for something a little less formulaic in its construction (I, too, had the mantra ”always quote the source material” repeatedly drilled into me at school). Once again I find myself bitterly disappointed in the short sightedness of modern politics and incredibly frustrated by the inability of a highly intelligent and rational group of people to persuade policy makers to re-examine their decisions in the face of inarguably damning evidence. I can only apologise for this being the sole new course of action I could think of, but all of the more direct approaches to solving this problem appear to have been attempted. It is ironic that the date on which I received my reply was 21st December, 2012, the day supposedly foretold by the Mayan calendar as that on which the world would end and the day on which I truly felt that the world of wine faced a catastrophic loss.